Explore the Rim! The Rim never stops turning - fire up your engines and Full Burn out to the edge of the 'Verse. Firefly: The Game - Blue Sun expands the game with new Supply Cards, Nav Cards, and Jobs. Two additional Reaver Cutters and new rules put the 'Verse on high alert. Reaver activity is on the rise and your Crew is on the menu! Expand the 'Verse: New Map Extension! A new 10"x20" Map extension adds the Blue Sun star system: a whole new area of the 'Verse to explore. Lord Harrow offers new smuggling opportunities, while Mr. Universe presents Big Damn Challenges for you to overcome! 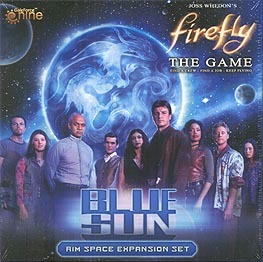 Ownership of Firefly: The Game is required to use this expansion set.